So, with the opportunity of multiple entries to the Cuisinart ticket giveaway to FBC 2011, one won’t do. As you may be aware, Cuisinart are giving away two tickets to the Food Blogger Connect conference from 12-14 August in London. And if you’re not, let me fill you in. Apart from being incredibly generous in allowing two people to go to FBC, Cuisinart is providing the small electrical appliances – blenders and grill – for TV chef Anjum Anand‘s video demonstration workshop at FBC 2011. Apparently the giveway gives the opportunity to take part in Anjum’s filmed cooking demonstration in the workshop too. It’s the third FBC and the only European food blogging conference on blogging rather than cooking that I’m aware of and, with Anjum Anand‘s video workshop amongst others, it keeps getting bigger and better. I should know, as I went last year, feeling naked as blogless. The idea for this smoothie comes from an ad that’s been running on French TV recently for something that smells of Apricots and Basil (girl riding bike, falls off approaching a guy…her apricots fall out of her basket and mix with his basil…eyes meet…) and the fact that Pierre bought 8 Charentaise melons at the market the other day. Yes, 8. Pierre likes buying lots of fruit, especially if he gets a good deal (reasoning: “but it’s only two euros for three melons”. Yes but Pierre, there are only two of us!). Unbelievably he will eat at least two melons in a day, and then some. Add a spritz of lime juice for some zing, and you’ve got a new super slick smoothie. 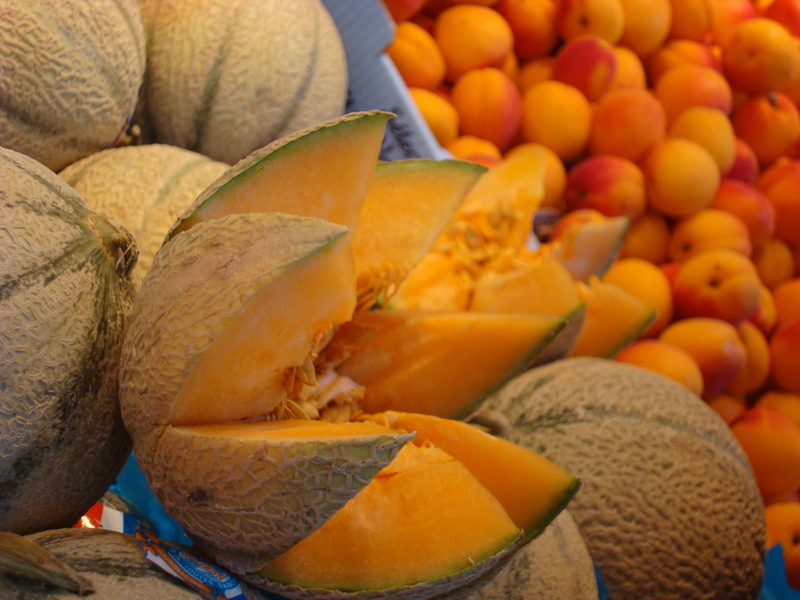 Chop the melon into chunks, put it in a freezer bag and pop it in the freezer at least 4 hours before you want to make the smoothie. Half the apricots and take the stones out. 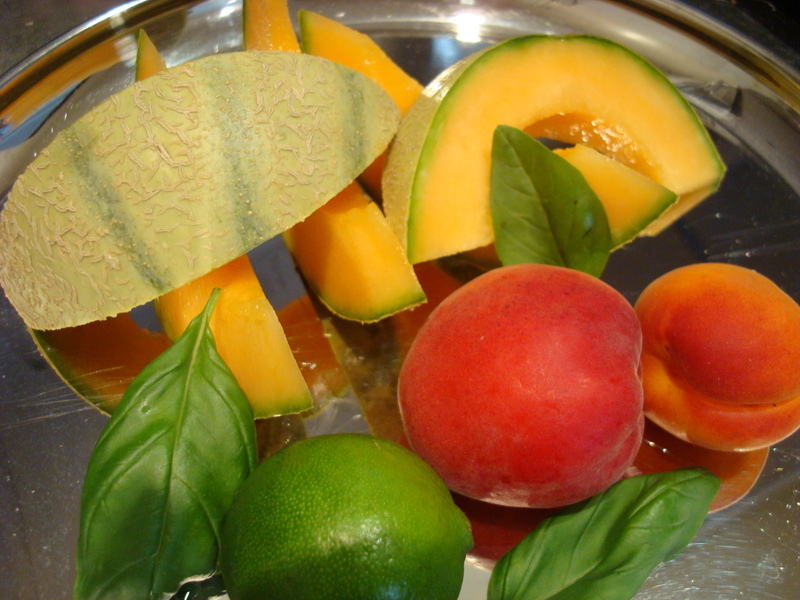 When the melon is frozen, put it in a blender with the apricot halves and basil leaves and lime juice and whiz. Add the lime juice, and half a glass of water if you like it more soupy. 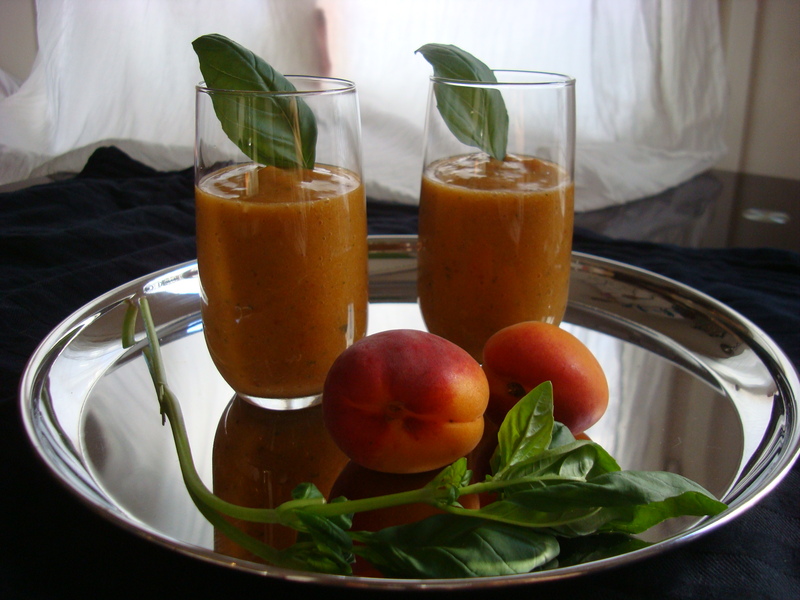 This entry was posted in Smoothies and tagged Anjum Anand, apricot, Cuisinart, FBC, melon. Bookmark the permalink.